Gmail had some issues a few days ago and reseted some email accounts so many people now want to backup their Gmail account(s). I got this request by email so I though I'd suggest a very simple (and free) way to backup your Gmail account: using Thunderbird. Using the exact instructions in this post, Thunderbird will not delete your Gmail emails and will not mark them as read so it acts exactly as a backup, without interfering with your actual emails. You can of course use this to send emails too (just like with any email client - I've used Thunderbird because it's easy to set up and cross-platform) but the purpose of this how-to is to use Thunderbird just to download your Gmail emails (so you can turn off the outgoing server if you want) so you have a local backup in case something goes wrong with your Gmail account. If you want to backup your Gmail account online, you can use TrueSwitch to copy all your emails into your Hotmail account or use Backupify which is free for a regular (non custom domain) Gmail account. 1. 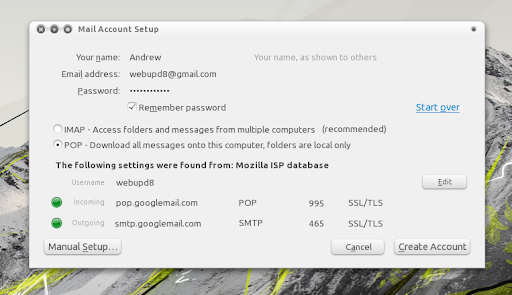 To backup your Gmail account using Thunderbird you'll firstly need to enable POP in Gmail. To do this, go to Gmail settings and on the "Forwarding and POP/IMAP" tab, under "POP Download" select "Enable POP for all mail (even mail that's already been downloaded)" under "1. Status". That's it! Now simply click "Get mail" and let the Gmail backup begin. 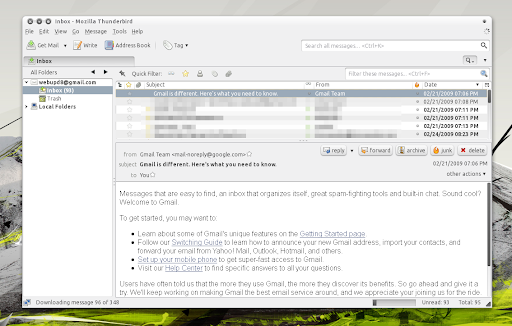 Thunderbird will download all your Gmail emails - this will take a while. Now whenever you want to update the "backup", simply open Thunderbird and let it do its job. If you're behind a firewall / router that blocks the incoming POP port (955), you can install TOR and then use it as a SOCKS proxy in the Thunderbird settings. Thanks to JC for the suggestion!